Chicken Jalfrezi | In Under 30 minutes! Indian dishes are one of our most requested recipes, so we are hitting you with another delicious one, Chicken Jalfrezi. In 30 minutes or less you can have a flavorful, home cooked Indian meal. No worrying about added sugars or iffy ingredients with this meal. When it comes to adding spice to your life, it doesn't just have to be through food. You can do it through dance, music, education or even through building your family. Spice can be defined as "to make more interesting or exciting" and all of the above can do just that! That being said, my preferred method if through food! Some of my favorite ways to spice up food are​ as follows. Seasonings like cumin, turmeric or garam masala. Vegetables like peppers, onions, or ginger. Herbs like cilantro or parsley. Make Your Favorite Indian Food At Home! If you're a take-out fanatic like me and miss the days of getting Indian take-out, we've got all the right keto recipes for you! 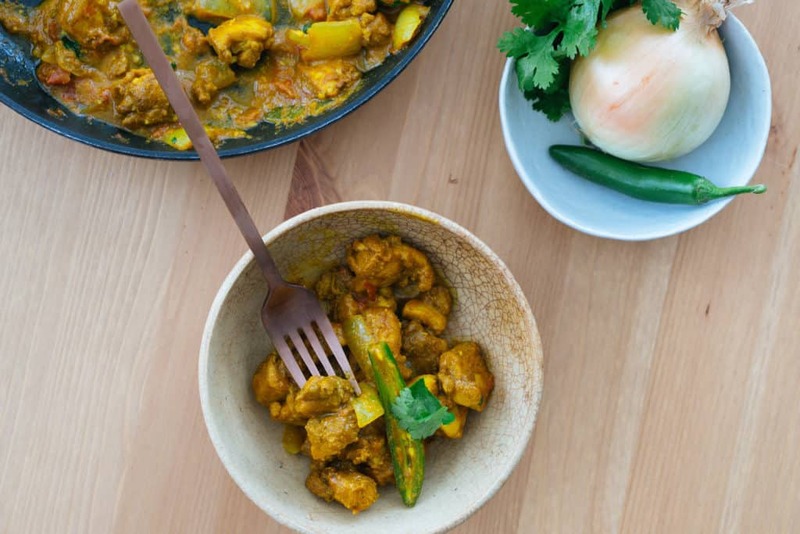 Of course, you can start off by making this chicken jalfrezi, but I also highly recommend you make our keto butter chicken and saag paneer. On the side you can make some keto naan and cauliflower rice. If you've got 30 minutes on hand and are looking for a change up, something to make your taste buds go wild, this recipe is a winner! It combines tender, fatty, chicken thighs with some fresh, simple ingredients and flavorful spices to make a perfect Indian take-out replacement. 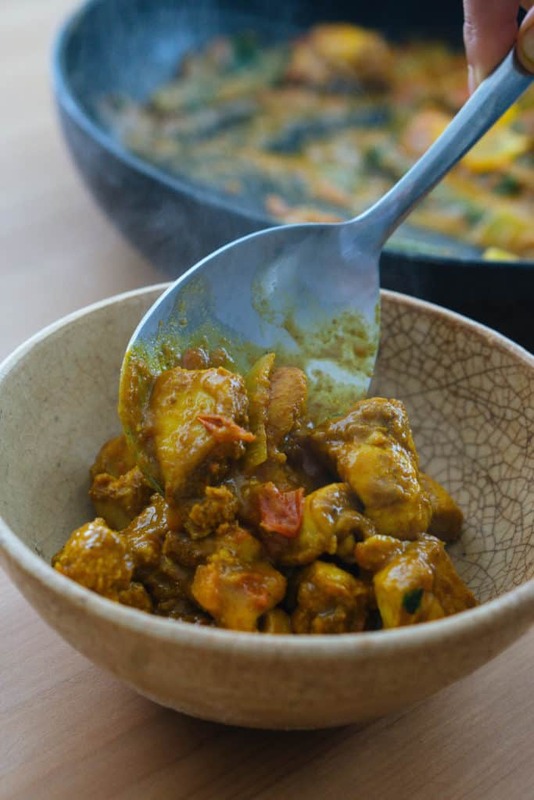 Make this easy chicken jalfrezi tonight and let us know what you think! 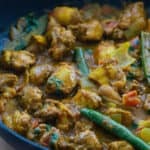 Recipe can be quickly added to MyFitnessPal - Search "KetoConnect - Chicken jalfrezi"
Chop the chicken up into bite size chunks and add to a bowl. Add 2 tsp cumin, 2 tsp turmeric, 1 tsp coriander and 1 tsp garam masala and a pinch of salt and mix to combine using your hands. Make sure all the meat is coated. Set aside. Chop the white onion in large chunks, the tomato in to medium chunks and the serrano peppers into fourths. Heat your pan to medium heat and add a tbsp of ghee. Add in the chicken and cook through. Remove from heat once cooked through. Scrape up the pan once chicken is removed and add another tbsp of ghee. Add in the minced garlic and onions and allow to cook down and become tender, about 1-3 minutes. Add in the tomatoes and peppers and cook down for about 1-3 minutes. Add in the remaining seasonings of turmeric, ginger, cumin and salt. Stir to combine. Add in the water and turn the heat up and allow to reduce down, a couple minutes. Once the sauce thickens a bit add in the chicken and cook for an additional 3-5 minutes. Remove from the heat and optionally, toss in some cilantro and enjoy!